Some weeks ago, the national water company, known by their initials, AyA, put in the water connection and new water meter for our house. Just a few weeks prior to that, a real genius truck driver had cut the corner to our property “a little short” and had taken out two of three water services at our corner. Now our new service sat within this same corner area, vulnerable to the same type of dopey driving. “I’ll fix this,” I said. At the corner, between the driving lane and the water meters, I dug a deep hole with a borrowed rock bar, dropped a heavy-wall 4x4 steel tube 3 feet into the hole, left it protruding 6 feet up into the air and filled the hole with concrete. Just for good measure, I filled the tube with concrete. The next dump truck to run short across this corner might take my tube out, but not without significant body damage to his truck. Admiring my work, our contractor sent a couple of guys to the new water meter and built a massive concrete vault and support platform for the meter and its associated piping. Now any errant driver would have to smash down my pole AND break through a foot of concrete. I hurried translator, Patricia, down to the workers for an investigation. In her excellent Spanish, she asked them, politely, what was happening (as I was asking them in my mind, “What the f*** are you stupid a***oles doing?! ?”) They were smashing up the (underground) ragged edges of the meter vault our contractor had built. Huh? Before these geniuses started digging, nobody could even see the danged rough edges. With an uneasy feeling, I drove us off to the farmer’s market. The good news was that the blow was coming from the AyA water main connection, not from my tank. But, there was nothing left at all of our nice concrete work; this, was not actually an AyA crew (they were an independent sub-contractor); they had almost no tools to work with; and, apparently (the OMG part), they had no way to shut off the water. I’ve grown to appreciate the creativity of the Costa Rican field workers as they make do with just about nothing. I think they could probably make an airplane out of the ubiquitous galvanized sheet metal, baling wire and “stuff” that they find lying around. But this wasn’t going to be one of those days. So, as I rolled up on their scene, it appeared that during their “trimming” of our concrete vault, they must have broken off the feed pipe going to our meter. Why this required breaking out the entire vault isn’t clear but caca happens here in the land of Pura Vida. The skilled craftsmen were just finishing up gluing together the elbows and stubs to line back up for a reconnect to the water main riser, which was still blowing. With the requisite waiting time for the glue to harden up enough before turning the water back on. I tried, hard, to acquire primer for the construction of our new house, even contacting the biggest manufacturer of PVC glue and primer in the USA. They assured me that their master distributor in CR had PLENTY of primer in their warehouse here. No they didn’t. They never even heard of primer. So, “Primer? We don’t need no stinkin’ primer. This is Costa Rica and our glue is magic. Pffft. Primer. Stupid gringo.” Back to the story. So, I watched with dropped jaw and bugged out eyes as one worker crammed his glue dobber up into the downward facing elbow socket coming off my meter and then, using a rusty hack saw blade, proceeded to cut apart the blowing (live) riser to proper length to meet up with the elbow. Immediately, he was drenched, the little hole he was working in filled with water (submerging the elbow socket and riser ends in a sea of mud). In the next second, he shoved the newly goobered up elbow over the newly raggedly cut end of the underwater riser, held it for 5 seconds, then stood up. I was struck dumb. The same guy dipped some muddy water out and tried to clean away the sight glass of our meter, I’m assuming so that he could verify that the slug of mud he had just introduced into MY water piping was gurgling happily down my water line to my storage tank where it could contaminate the entire water supply. POP! The new meter elbow blew off of the riser. Now the water was shooting straight up in the air. I backed out of range. Then I walked away. Why get any more worked up. I’m retired, damn it. Two hours later, I go back out to see how things are going and the crew is gone. 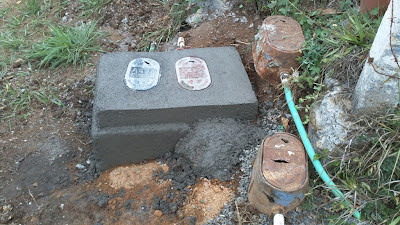 The blow is no longer erupting into the sky and two of the four meters (both mine) are encased in new concrete. See the photo. Notice the great workmanship of the concrete and the cute little step they formed into the side of the new vault. I have no idea what the little step does for them but it does nothing for me. Notice the Tico pride which they must have poured into this “repair,” as they ensured that the two meters were cockeyed with respect to each other, before they secured this example of their master craftsmanship for all the ages amidst the setting concrete. Notice the blob of free-poured concrete on the front of the vault WHICH IS EXACTLY WHAT (they said) THEY HAD BEEN SENT OUT TO REMOVE FROM MY CONTRACTOR’S VAULT WORK. Think they’re going to send me a bill for screwing up their system with my sub-standard concrete work and costing them all of this labor and water loss?